Mekong Dam Victims - Laos. 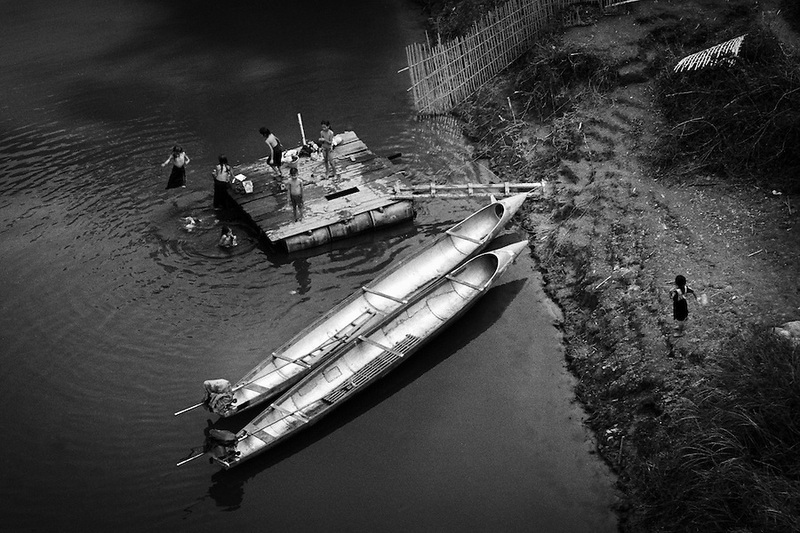 Children playing in the river near two socalled "bomb boats" made out of fuel drop tanks used by US military planes during the Vietnam war. After the construction of the Theun-Hinboun Dam in Laos more than 29,000 people in 71 villages have lost fisheries, rice fields, vegetables gardens and fresh drinking water supplies as a result of the dam. An expansion project is currently under construction and will displace another 4,200 mostly indigenous people from their lands in the reservoir area and displace or negatively affect another 50,000 people living downstream, on project construction lands, and in resettlement host villages. Known as "The Mother of Waters", more than 60 million people depend on the Mekong river and its tributaries for food, fresh water, transport and other aspects of daily life. The construction of big dams is now threatening the life of these people aswell as the vital and unique ecosystem of the river.